Riga, 15th November 2011 — ‘This is a special day for us and even more so for the global e-mobility’ Andris Dambis, director of the motorsport engineering company OSC, opens his statement. Media, experts and guests have gathered today in Riga to witness the roll-out of electric rally-raid vehicle just 8 months after the project was officially launched. In the middle of December the car will leave to South America to participate at the Dakar 2012, the toughest endurance rally in the world. The construction of OSCar eO is truly unique. 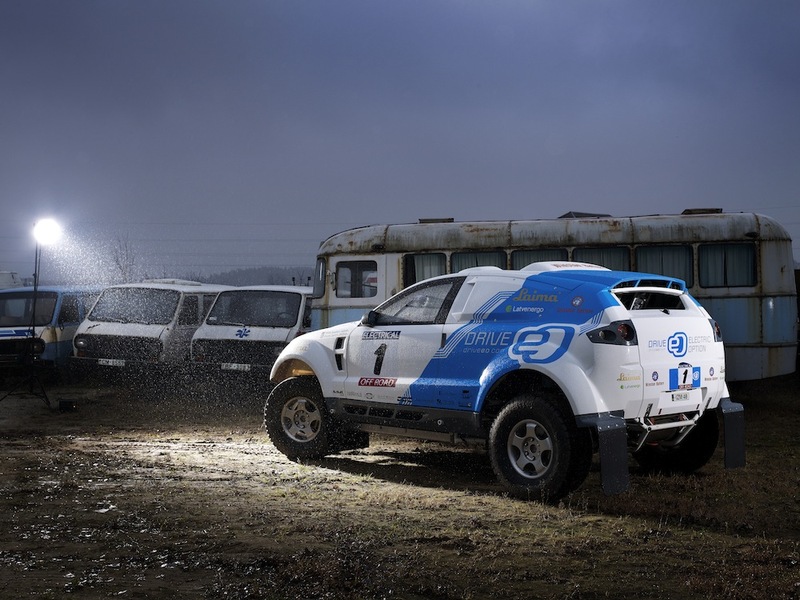 OSC engineers had to start from clean sheet of paper to create an all-wheel- drive electric car capable of completing 600 to 700 km special stages over the most gruelling terrain. ‘We were anticipating revisions in our system architecture several times during the development phase’ Dambis admits. The layout finally settled at a single electric motor coupled to a conventional transmission which replaced the initial concept of two motors, each fitted to an axle. The OSCar eO is powered by an electric motor nominally rated at 210 kW. A similar electric machine is coupled to an internal combustion engine and functions as a generator to recharge the 52.5 kWh battery pack. Winston Battery, the technical partner from The People’s Republic of China, supplied the batteries and the 3.5 litre V6 range extender engine was provided by the local Nissan dealer Skandi Motors. Team Latvia is going to line up a strong support team to help the OSCar eO through the route of the Dakar 2012. The electric vehicle will carry number #370 and will be driven by Maris Saukans and Andris Dambis. At all times they will be accompanied en route by a conventionally powered OSCar vehicle with the Russian driver Anton Grigorov at the wheel. His navigator Ainars Princis has a vast Dakar experience with a respectable 24th finish position in the 2009 edition when partnering Janis Azis. Last but not the least, a DAF truck will provide any immediate assistance on the route. Its international crew consists of the French pilot Jean-Charles Mauri, Belgian navigator Jean-Charles Mauri and Latvian engineer Kaspars Dambis. Two more assistance trucks and two 4×4 pick-ups complete the impressive line-up of 20 people. The 2012 edition of the Dakar rally will finish in Lima, the capital of Peru, which is an extension of the traditional route through Argentina and Chile. The sea-side resort of Mar Del Plata, lying 400 km south of Buenos Aires, is the new host for the start of the rally on 1st of January, ahead of 9000 kilometres in 2 weeks. Special stages vary in length between 29 and 557 kilometres a day which is topped up by lengthy road sections. Participation of Team Latvia at the Dakar 2012 has been made possible by the sponsorship from Laima, a Latvian sweets manufacturer. ‘The name of Laima carries strong links to Latvia. We are supporting Latvian engineers in their effort which is globally important for environmental protection. We want to be there when the new electric vehicle goes out to prove itself. Our cooperation results in alternative forms of energy utilisation’ explains Dace Kokina, head of marketing at Laima.